During the 2001 Canadian Grand Prix in Montreal, I had the chance to do a series of graphics about the race, the drivers, the cars and a few other topics related to the event, which was the eight leg of Formula One racing for the year. One subject that caught the interest of editors at the Montreal Gazette was tires — the racing tires that were used in the cars. We decided to create a stand-alone infographic on how racing tires are made. Below is the graphic that came out of the discussions. 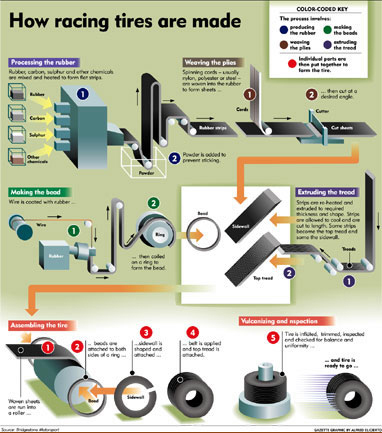 Although the graphic is specifically about the processes involved in the manufacture of the highly specialized Formula One racing tires, they are similar to those employed in making tires for cars and trucks. The 2001 edition of the Grand Prix, held at the 4,521-kilometer Circuit Gilles Villeneuve, was the first time two brothers — Germans Michael Schumacher of the Ferrari team and Ralph Schumacher, representing Williams-BMW, finished first and second in the 69-lap, 305,049-kilometer race. Crowd favorite and Quebec’s own Jacques Villeneuve, of the British American Racing-Honda team, was out of the race in his 34th lap when he encountered driveshaft problems. Earlier in the year, in Australia, Villeneuve also wasn’t able to finish the race when he crashed into Ralph Schumacher. Villeneuve, son of the F1 driver for whom the Montreal racing circuit was named, was F1 World Champion in 1997. Graphic by Alfred Elicierto, published in the Montreal Gazette in June 2001.